Sucking pig meat fried on earthenware frying pan (rynka) | Шинок "Коса над Чаркою"
Prepared according to the ancient medieval recipe – pork served with cranberry sauce. 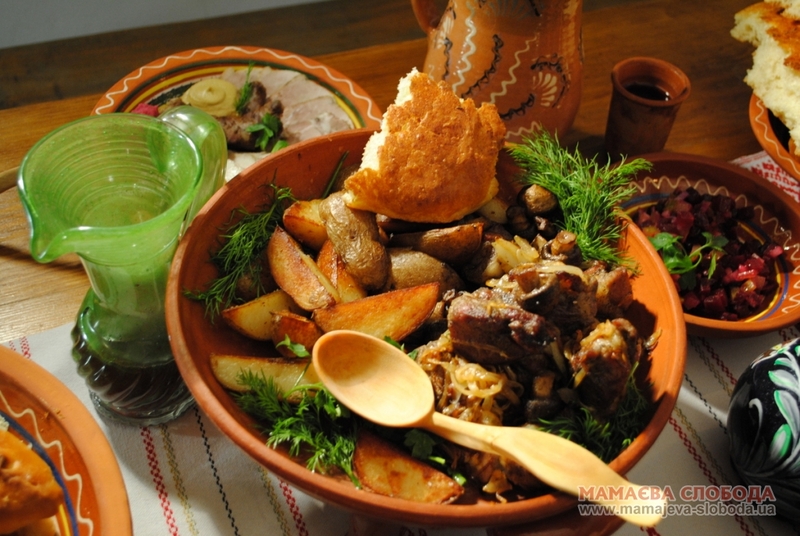 Ukrainian gentry and Cossack superiors liked to taste it during some special holidays. Fresh pork was assiduously washed, salted, peppered and filled with garlic. Lard was heated on the frying-pan and meat was fried on both sides. They added some salted water to the frying-pan and put it in a stove. Thus the meat was braised until it became crispy. The meat was stirred and constantly watered with the meat sap. To the meat gravy they added cranberry broth sweetening it with buckwheat or linden honey. The gravy was served as a side to flavoured meat with sprinkle of greenery.